How Do Registrants Log In to the Webinar? What is an access link? Your access link is your direct, unique link to access the webinar that you've registered for. If webinar has started: when you click on your access link, you'll be directed straight into the webinar room. If the webinar hasn't started yet: you'll be directed to a waiting page with a countdown until the webinar's start. What is an access key? 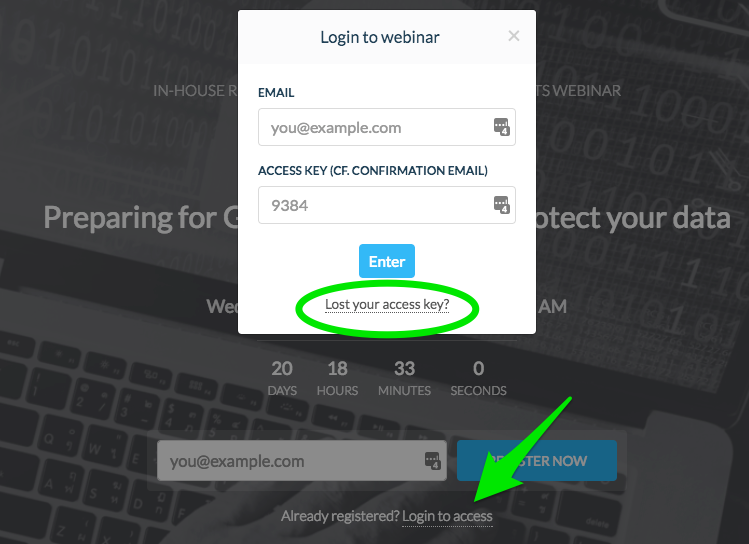 Your access key is a 4-digit unique code per registrant that you can use to enter the webinar room along with your email address. Registered for a webinar? Wondering how to access it? You should have received one confirmation email as soon as you registered for the webinar. 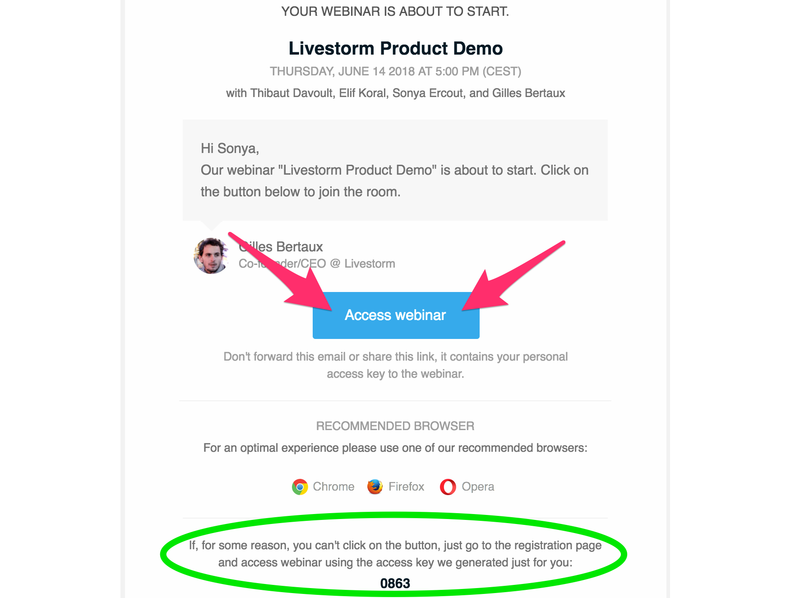 You will receive two notification emails: one hour and 5 minutes before the start of the webinar (as long as the webinar host activated these). All three of these emails include your access link and access key to enter the webinar room. Please contact the host of your webinar and ask them to resend your access link. Or contact us at hello@livestorm.co and we can help you find it. Did you unsubscribe from Livestorm emails? Please contact us at hello@livestorm.co to resubscribe. Don't want to go searching through your emails for the access link? Click on Lost your access key? * If you're the host of a webinar and want to give a registrant access, check our our article: How Do I Resend Access Links?